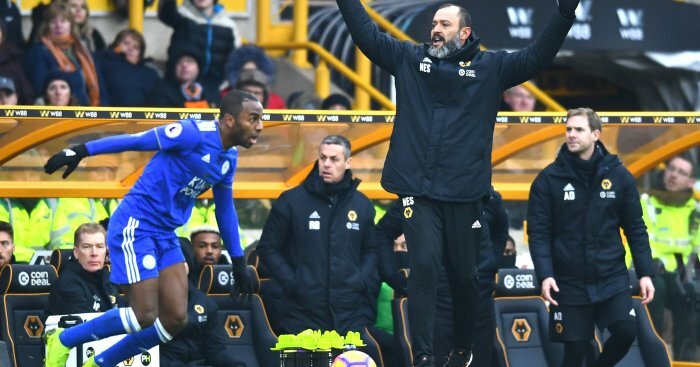 Wolves boss Nuno Espririto Santo saw red this weekend, Marcos Alsonso should have seen red and there’s no doubt who was the most “brassed off” this weekend, all in Ref Review. Diego Jota settled a wild encounter in injury-time to give Wolves a famous 4-3 win and spark scenes of jubilation on the bench. 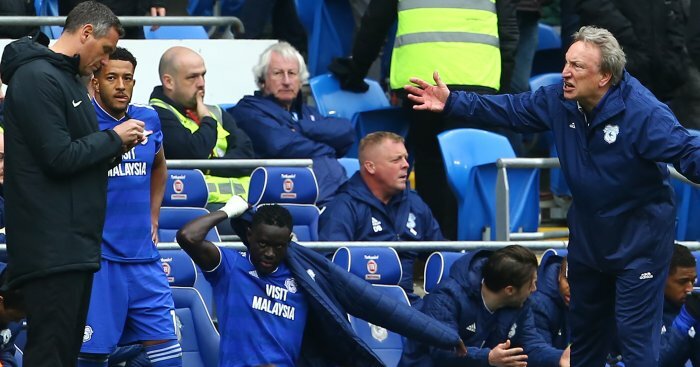 It all became too much for Nuno Santo however who raced onto the pitch to celebrate, an act that saw him sent to the stands by Chris Kavanagh. Interestingly it was the same ref Kavanag, who elected not to ‘send off’ Jurgen Klopp for invading the pitch after Liverpool’s late winner against Everton earlier this season, though the Wolves boss had no problem with the ref’s call. Jurgen Klopp praised “world class” Mo Salah after the Egyptian King scored twice in Saturday’s tense 4-3 win against Crystal Palace. 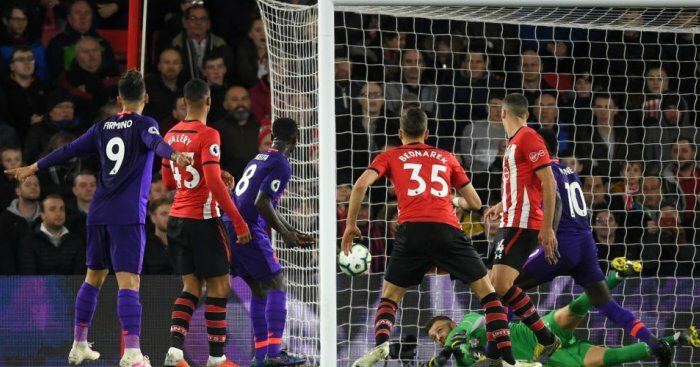 However not everyone was fulsome in their praise of Liverpool’s top scorer as he was involved in yet another ‘diving’ storm. 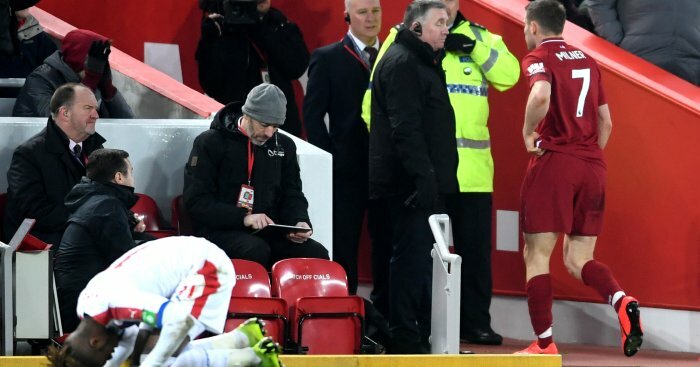 With the Reds trailing 1-0 at Anfield Salah went down like a folding deckchair after a challenge from Mamadou Sakho. And while the Palace defender did swing his leg in the direction of the ball there didn’t appear to be any direct contact with said leg and Mr Salah. 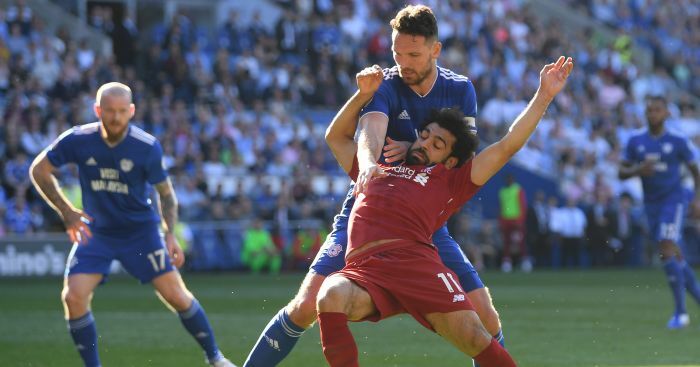 Happily Jonathan Moss was unmoved and while Salah should really have been booked for simulation, the decision not to award a spot-kick was the correct one. Given he was already on a booking Milner’s challenge on Wilfried Zaha was pretty ridiculous. 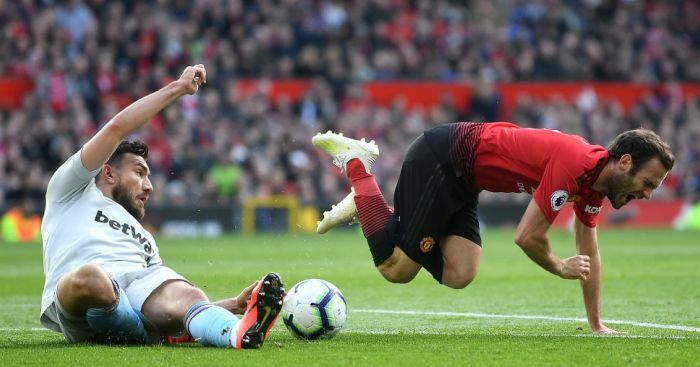 Some observers on social media actually thought it was a straight red but it was in fact for a second caution, meaning he will only miss one game. With just a few minutes left Milner got it all wrong as he went to play the ball only to clatter Zaha on the shin. Premier League players are much maligned in this column every week but every once in a while a player will produce an act of selfless sportsmanship to show just why we all still love ‘The Beautiful Game’. With Newcastle a goal up and looking to put their crucial relegation six-pointer against Cardiff out of sight, Rondon smashed a shot goalwards that cracked Joe Bennett clean in the face. Bennett hit the deck in worrying fashion as the ball fell nicely back to Rondon. With the goal in sight he chose not to have a pop though, and instead kicked the ball out so that his stricken opponent could receive treatment. It was fabulous sportsmanship that received a deserved ovation from both sets of fans. 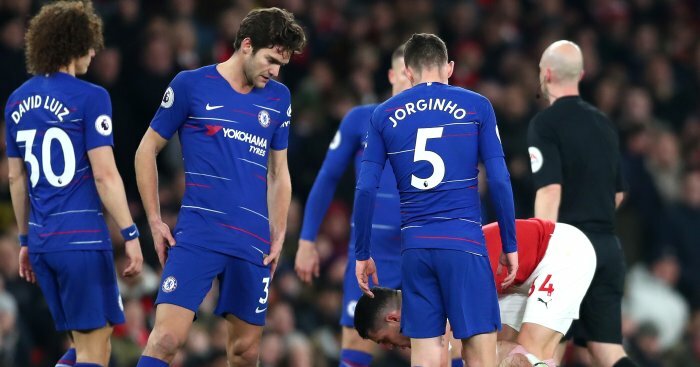 Should Marcos Alonso have seen red after appearing to slap young Ainsley Maitland-Niles in the box during Chelsea’s 2-0 defeat on Saturday evening? He was grappling with the Arsenal man after a corner and after an Alonso header drifted harmlessly wide of the post he swung a hand at Maitland-Niles. The impact was pretty minimal in terms of force but you just can’t slap opponents these days and given that he wasn’t even booked he could yet face retrospective action. Amazing decision from Andre Marriner who somehow failed to blow for a penalty after Raheem Sterling was played through in the area by a fantastic ball from Kevin De Bruyne. Sterling was brought down by Terence Kongolo, who slid in from the side and it looked a poor, poor challenge. Amazingly Marriner deemed Kongolo’s clumsy effort to be legal and waved play on. He was nowhere near the ball and in all honestly that was a travesty of a call from the officials. 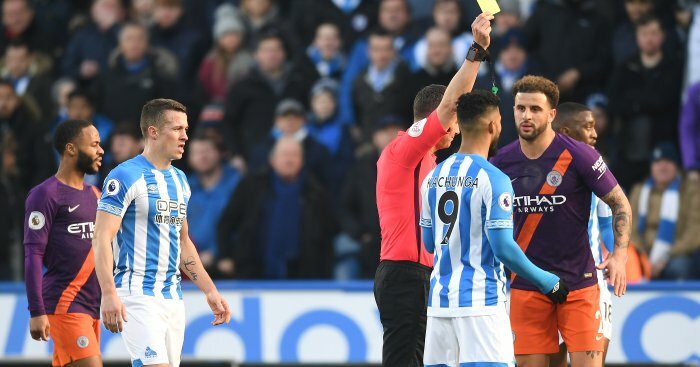 A growing number of City fans are starting to form an opinion that England defender Walker may be becoming too much of a liability for the champions after several dubious performances in recent weeks. He was guilty of another rash, studs up tackle on Chris Lowe on Sunday that earned him a deserved caution, but Lowe’s rolling around afterwards was undignified and could be described as “theatrical” at best. A quality goal for the Citizens as Raheem Sterling finished off a precise move with a rare headed goal. However Leroy Sane should have been flagged for offside before he provided the assist for Sterling. The young German was just off when he received Kevin De Bruyne’s initial pass. It was very close, but replays confirmed he was actually just off. 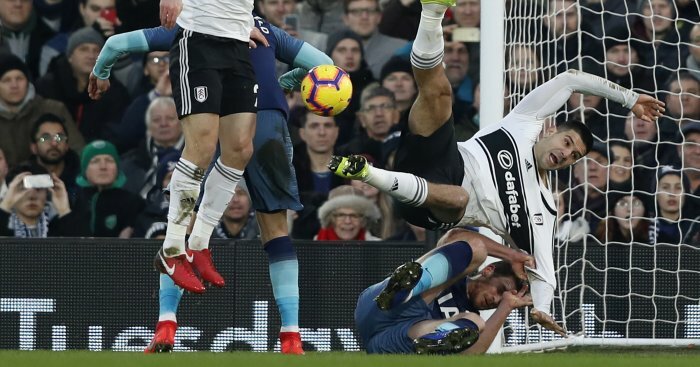 Mitrovic was bellowing for a penalty as he and Jan Vertonghen tussles in the area with the Spurs defending grabbing a big chunk of Mitrovic’s shirt as both players went to ground. He was definitely a lucky boy Vertonghen though as we’ve certainly seen those given. Fulham can count themselves unlucky to lose on Sunday, and they could have been out of sight by half-time against Spurs. They thought they had scored to make it 2-0 when Ryan Babel lofted a ball across the box to Andre Schurrle on the right with the German then trying his luck with a well hit volley. Hugo Lloris made a wonderful save at the near post but Alexandar Mitrovic was there, waiting patiently, to nod home the rebound. However, the offside flag was raised – correctly – and the goal was ruled out. Another big call for a penalty from Mitrovic as Lloris swiped the ball from under his feet as he tried to race onto a Schurrle pass. The Fulham striker, who appeared to get there just before the Spurs keeper, tumbled over and instantly had his hands up for the foul, but again, nothing doing. A frenetic game at Craven Cottage looked to be heading for a draw – a vital one for the hosts and the first of the season for Spurs – but a late goal from Harry Winks broke Fulham’s hearts. They had two solid penalty appeals knocked back and a goal ruled out for a marginal offside call. One another day at least one of those penalty appeals would have been given and to come away with nothing after playing so well must rankle. Strange but true. James Milner’s two red cards for Liverpool have both come against Crystal Palace and both for fouls on Wilfried Zaha. He missed the ball at Anfield and clattered Zaha on the right shin. A (second) booking all day long and to be fair the Liverpool man accepted his fate without much fuss.